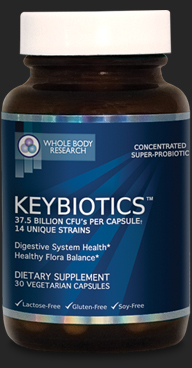 Keybiotics are super-probiotic supplements containing 37.5 billion colony forming units of friendly bacteria from 14 unique strains of beneficial bacteria, making it the most powerful probiotic on the market today. Keybiotics are specially engineered to withstand stomach acids and bile, allowing them cover the entire G.I. Tract and balance out Candida and other types of yeast overgrowth quickly and efficiently. 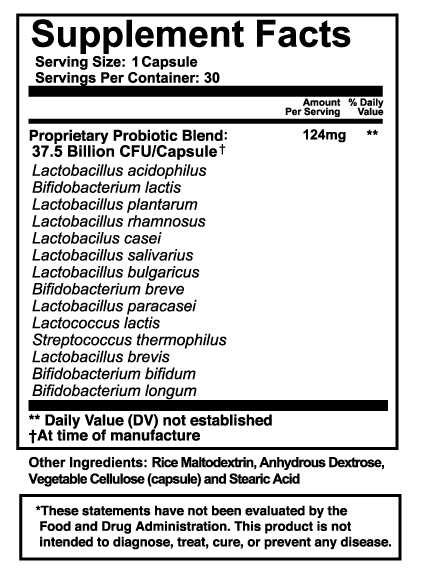 How is Keybiotics different from other probiotics? Keybiotics contains the largest concentration of CPUs of any probiotic on the market today, and are made from the same strands proven for effectiveness in 90% of all clinical studies done with probiotics. Keybiotics contains 14 unique strands of powerful beneficial bacteria, specifically selected to address the different symptoms of Candida and yeast overgrowth, balancing your gut in the fastest amount of time possible by taking a probiotic supplement. Every batch of Keybiotics is tested for purity and potency by an independent 3rd party laboratory, ensuring their effectiveness so you reap the maximum benefits. What are the exact strains and ingredients? Since you are getting in on our New Customer Special, you will always be able to re-order Keybiotics at the $39.99 per bottle price, but when you act today you can take advantage of 2 additional options for even more savings. If you're like 9 out of 10 people who try Keybiotics, you'll want to keep on taking them and enjoying the benefits, so we suggest you stock up now for maximum savings. Should you decide you don't want them later for any reason you can always return them for a full and fast refund. Keybiotics contains no stimulants of any kind, and absolutely no allergens or toxins. They are gluten-free, lactose-free, and packaged in vegetarian capsules to be safe for consumption no matter what your dietary restrictions. While refrigerating will not have a negative effect on Keybiotics, it’s not necessary to retain the product’s effectiveness. How do I take Keybiotics? Take Keybiotics once per day, preferably with a meal. No need to panic. Simply take your next dose as scheduled. As you build up beneficial flora in your intestine, you’ll continue to notice positive results even when you’ve missed a dose. Keybiotics has no negative side effects. They are made from strains of bacteria that occur naturally in the human body and can only improve your body's digestion and overall health. Will they give me bad breath? Bad breath is an unwelcome and very common issue when taking many probiotics, so when we designed Keybiotics we knew we would be facing this challenge. After many tests we finally discovered the reason why most probiotics give you bad breath – and it was a surprisingly easy fix! Can I take Keybiotics with other medications? You should always consult your doctor before taking any supplement with other medications, but in nearly all cases Keybiotics are completely safe to take. Usually if you are taking antibiotics it becomes even more important to take Keybiotics to help replenish the good bacteria in your gut that the antibiotics kill off. You will be billed today only, for the amount you order only. Whole Body Research never does any form of auto-billing or order shipping – what you see is what you get. For re-orders please call our Customer Service line at (800) 240-7721, and be sure to have your initial Order Number handy to guarantee you receive the same price. Whole Body Research is a nutraceutical company based in Los Angeles, California. We pride ourselves in producing the highest-quality nutritional supplements, all of which are engineered by our team of researchers and 3rd party tested for quality and purity. We can be reached on our Customer Support line at (800) 240-7721 from 6am – 8pm Pacific, Monday through Friday, and 5am to 5pm Pacific, Saturday and Sunday, or by email at [email protected] We are committed to helping you be your healthiest and happiest.